The Springfield Armory, located in the city of Springfield, Massachusetts, was the primary center for the manufacture of U.S. military firearms from 1777 until its closing in 1968. The site is preserved as the Springfield Armory National Historic Site, Western Massachusetts’ only unit of the national park system. It features the world’s largest collection of historic American firearms. Famous first as the United States’ primary arsenal during the American Revolutionary War, and then as the scene of a confrontation during Shays’ Rebellion, the Springfield Armory in the 19th and 20th centuries became the site of numerous technological innovations of global importance, including interchangeable parts, the assembly line style of mass production, and modern business practices, such as hourly wages. 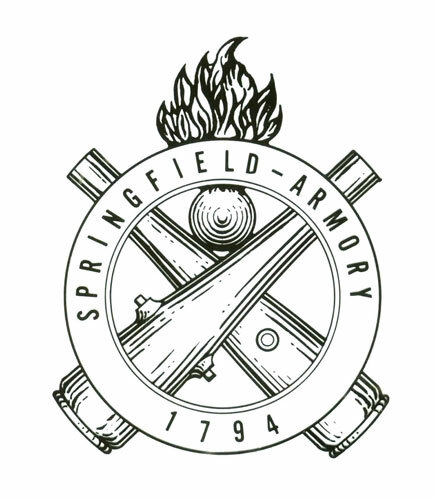 Numerous firearm models produced at the Springfield Armory from 1794 to 1968 were referred to as “Springfield rifles”. Local and colonial militia used the bluff on which the Springfield Armory would become located during the 17th century for militia training, particularly after the Attack on Springfield during King Phillip’s War. In 1777, during the American Revolutionary War, George Washington scouted and approved the site of the Springfield Armory, after it was referred to him by General Henry Knox, his artillery chief. Although a small town at the time, Springfield, Massachusetts, offered obvious geographical advantages—it lay at the intersection of three rivers (including the major Connecticut River), and four major roads headed toward New York City, Boston, Albany, New York, and Montreal. Additionally, Springfield is located just north of the Connecticut River’s first waterfall (Enfield Falls), which is too steep to be navigated by ocean-going vessels. Thus, Springfield was the first town on the Connecticut River protected from attack by seafaring naval vessels. The Armory site itself sits atop a high bluff like a citadel, overlooking a wide stretch of the Connecticut River, at its confluence with the Westfield River. General Knox concurred with Washington that “the plain just above Springfield is perhaps one of the most proper spots on every account” for the location of an arsenal. In 1777, patriot colonists established “The Arsenal at Springfield” to manufacture cartridges and gun carriages for the war effort. During the Revolution, the arsenal stored muskets, cannon, and other weapons. Patriots built barracks, shops, storehouses, and a magazine. Some doubt exists that the colonists manufactured arms during the Revolutionary War. After the war, the Army kept the facility to store arms for future needs. By the 1780s, the Springfield Arsenal functioned as a major ammunition and weapons arsenal. Sometime later, when manufacturing became important, the arsenal expanded to a second area south and west in Springfield, where water power was available. Around that time, the Mill River was dammed to form a mile-long lake called Watershops Pond. The main shops were behind the dam and a foundry was built below it. This factory was modernized, and the greater part of machining for Springfield and Garand rifles was conducted in it. In 1786, Daniel Shays, a Revolutionary War soldier, became one of the leaders of a large group of rebels, who came mostly from Western Massachusetts, but also from surrounding states. These rebels had grievances with the Government of Massachusetts, which ranged from land seizure for debts incurred while fighting the Revolutionary War to the paucity of hard currency. Rebels planned to use the armory’s weapons to seize control of the state government. The armory was defended by state militia, who fired grape shot at the rebels on January 25, 1787, driving them away. The rebellion was crushed soon afterward. This event had some influence on the Federal Constitution Convention, in which the United States Constitution was drafted, giving the federal government more power than the individual states. Shays’ Rebellion led many of the upper classes, who feared a popular uprising, to vote for the new federal Constitution that supported a stronger central government. In 1793, the National Arsenal contained brass ordnance, howitzers, traveling carriages, shot strapt, canisters filled, quilted grape, iron shot, shells, powder, musket ball, cylinders, caps, paper cartridges, fuses filled, muskets, swords, various military stores, and implements. In 1795, the Springfield Armory produced the new nation’s first musket. 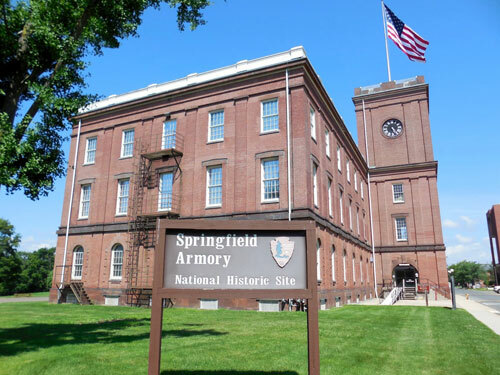 Fueled by the Springfield Armory, the City of Springfield quickly became a national center for invention and development. In 1819 Thomas Blanchard developed a special lathe for the consistent mass production of rifle stocks. Thomas Blanchard worked at Springfield Armory for 5 years. The lathe enabled an unskilled workman to quickly and easily turn out identical irregular shapes. The large drum turned two wheels: a friction wheel that followed the contours of the metal rifle pattern, and the cutting wheel that imitated the movements of the friction wheel to make an exact replica of the pattern in wood. In the 1840s the old flintlock gave way to a percussion ignition system that increased the reliability and simplicity of longarms. The Springfield Armory was largely involved in the growth and influence of the Industrial Revolution. Much of this grew out of the military’s fascination with interchangeable parts, which was based on the theory that it would be easier to simply replace firearm parts than make battlefield repairs. Mass production of truly interchangeable parts demanded greater use of machines, improved gauging, quality control, and division of labor; all characteristics of the Industrial Revolution. From these individual components, the concept of the assembly line was devised. The Springfield Armory also contributed to improved business management techniques. Colonel Roswell Lee, hired as superintendent in 1815, brought centralized authority, cost accounting for payroll, time, and materials, and increased discipline to a manufacturing environment—all business practices still in use today. With the destruction of the Harpers Ferry Armory early in the American Civil War, the Springfield Armory was briefly the only government manufacturer of arms, until the Rock Island Arsenal was established in 1862. In 1865, Master Armorer Erskine Allin introduced the “Allin Conversion”, which incorporated the far more advanced design of breech-loading into the now-obsolete muzzleloaders, thereby extending their service life. In 1891 a new function was assigned to the Armory –– it became the army’s main laboratory for the development and testing of new small arms. One of the most distinctive elements of the Armory is the fence surrounding the site, which was started after the Civil War and completed in 1890. Unable to find funding for the purchase of a fence, Major James W. Ripley requested obsolete cannons from government storage, some from the Revolutionary War. He had the cannons sent to a local foundry to be melted down. The foundry kept some of the iron as payment, and the remainder was cast into 9-foot palings, formed as pikes and spearheads which were then sunk into a red sandstone base. During the Spanish-American War, it was recognized that the Spanish Mauser Model of 1893, exhibited characteristics superior to the “trapdoor” Springfield and Krag-Jørgensen rifles carried by the United States troops. On August 15, 1900, Springfield Armory completed an experimental magazine rifle which they believed to be an improvement over the Krag. They fashioned a clip loading magazine rifle in which the cartridges were contained within the stock, preventing damage to an otherwise exposed magazine. It was approved for production in as the Model 1903. Mauser later sued for patent infringement and won royalties from Springfield. By the time that the United States entered World War I, approximately 843,239 standard service Model 1903 rifles had been manufactured. However this was insufficient to arm U.S. troops for an undertaking of the magnitude of World War I. During the war Springfield Armory produced over 265,620 Model 1903 rifles. In addition, the War Department contracted for production of the M1917 Enfield Rifle to help aid American troops. These, along with the additional 47,251 rifles produced by the Rock Island Arsenal and the weapons already in service, were enough to supply the war effort. During WWI the Springfield Armory produced ~25,000 M1911_pistols before all facilities were dedicated to production of M1903_rifles. In 1919, when John Garand was 31, he came to Springfield, where he worked to develop a semi-automatic rifle. Over the next five years many designs were submitted for the rifle, but none met the army’s rigid specifications. In 1924, Garand offered a design that was approved for further testing. This was the famous M1, or “Garand rifle” as it came to be known. The army adopted the rifle in 1936, and production began the next year. This began what was to become the greatest production effort in the armory’s history: during the entire production history of the M1 rifle, the Springfield Armory produced over 4.5 million of them. The M1’s accuracy and durability in battle earned it high praise. General Douglas MacArthur reported on the M1 to the Ordnance Department during heavy fighting on Bataan that: “Under combat conditions it operated with no mechanical defects and when used in foxholes did not develop stoppages from dust or dirt. It has been in almost constant action for as much as a week without cleaning or lubrication.” Further testament to the M1s role in combat was given by another well respected military officer. General George S. Patton, Jr. reported to the Ordnance Department on January 26, 1945: “In my opinion, the M1 Rifle is the greatest battle implement ever devised.” In the face of overwhelming odds, the capability of the M1 rifle to deliver superior firepower would most often carry the day. The last small arm developed by the Armory was the M14. The M14 has evolved over the years into a more modern sniper rifle—the M21. By the time the U.S. was involved in the Vietnam War, Springfield Armory developed not only rifles but machine guns for ground and air use, grenade launchers, and associated equipment. Many weapons were not manufactured at the Armory, but plans and specifications were drawn up for the use of private contractors who built them elsewhere. In 1968, U.S. Secretary of Defense Robert McNamara announced the closure of the Springfield Armory. Outer portions of the armory were sold off, including the “Water Shops” production facilities, which are listed on the National Register of Historic Places as the Water Shops Armory. The core site was preserved and the property was turned over to the city and state. It is now the Springfield Armory National Historic Site, and is managed and operated by the National Park Service. As of 2011, the 35 acres behind the Springfield Armory (and several of its former buildings) house Springfield Technical Community College (STCC). STCC is the only “technical” community college in Massachusetts, and aims to continue the legacy of technological innovation at the Springfield Armory site. The Main Arsenal Building and the Commandants House were extensively renovated by Eastern General Contractors of Springfield, MA between 1987 and 1991. The Main Arsenal now houses the Springfield Armory Museum, which includes the Benton Small Arms Collection, one of the largest collections of weaponry. In 1974, the Springfield Armory name was licensed to Robert Reese, to form Springfield Armory, Inc., a company that manufactures semi-automatic versions of the M14 rifle and M1911 pistol. The company is not located in or near Springfield, Massachusetts and has no direct association with the original Springfield Armory. The current Springfield Armory, Inc., based out of Geneseo, Illinois, manufactures several of its weapons on the exact blueprints and to identical specifications as the original government owned Springfield Armory. Springfield Armory, Inc. has expanded its line of firearms to include modern day sporting rifles and polymer pistols as well as Historical American icons, namely the M14 and M1911.